Having music with your food is great, but having live music is even better. Listen to talented singers perform your favourite songs at these venues hosting live bands and musicians. Read on for Chope’s picks of bars and restaurants with live music, ranging from smooth jazz to twanging country. And who knows? You might just find your next favourite evening hangout. Dining at Sentosa is the ultimate treat. The great food, the cool breeze, the smell of the sea… how could it get any better? Bob’s Bar at Capella Hotel has the answer. Paying homage to the glamourous Golden Age of Havana, Bob’s Bar serves up authentic Caribbean grilled meats, sinful cocktails, and enchanting live music to give you the complete tropical paradise dining experience. Visit this Caribbean-inspired restaurant on the weekends to catch their house band serenading you with lively Cuban tunes as you sip a mojito and watch the sun dip below the sea. Now, this is the ultimate treat. Find it at 1 The Knolls, Sentosa Island, Singapore 098297. Earn 2X Chope-Dollars with the code TASTYBLOG. Gather round y’all, because do we have news for you. Get hot and crispy fried chicken from the American South, all the high-quality bourbon you could ask for, and twangy country notes at The Beast, Singapore’s very first bourbon bar. The Beast is a great place for a guy’s night out, welcoming you with a huge selection of fine bourbon and a generous slice of homey Southern hospitality. Make yourself at home as you munch on Southern soul food and catch up with your mates. Kick back and enjoy live acoustic country on Fridays, or if you’re brave (read: tipsy) enough, steal the show during their open mic sessions on Thursdays. Find it at 17 Jalan Klapa, Singapore 199329. Taste the glitz and glamour of the American Jazz Age at Monti, probably the most gorgeous jazz lounge in Singapore. This classy, chic, and sophisticated lounge is perched on the waterfront at Fullerton pavilion, luxuriously furnished with comfortable sofas and armchairs for you to sit back, soak in the smooth tracks, and enjoy the beautiful view of the Singapore river at night. If that person you’ve been trying to impress is a jazz fan, then Monti is perfect for a romantic date. With gentle jazz tunes, a sparkling riverfront, and a glittering night sky, it’ll be all too easy to fly her (or him) to the moon and play among the stars. Find it at 82 Collyer Quay, The Fullerton Pavilion, Singapore 049327. There are three things (in our opinion) that make a perfect weekend night: yummy bar snacks, intoxicating cocktails, and awesome music. Brand new and perched on top of the 1919 Waterboat House, The Rooftop gives you all three, and throws in gorgeous views of the CBD to boot! 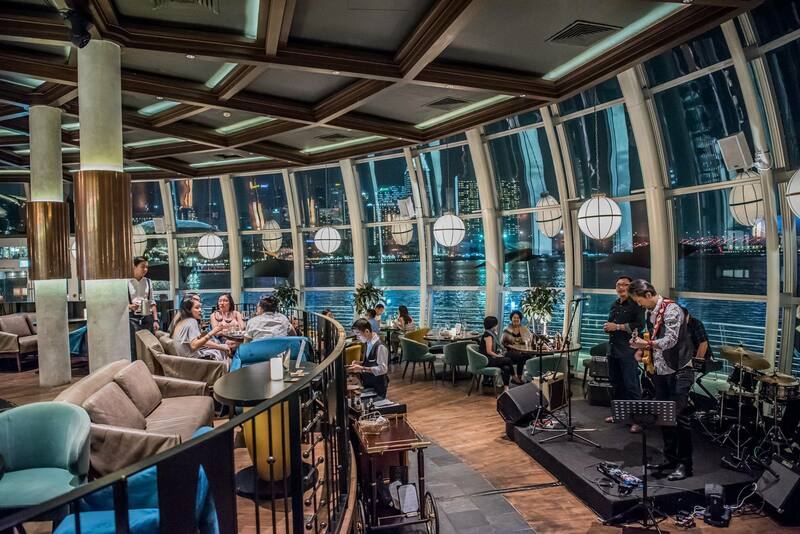 Take in the beautiful CBD skyline stretching from the Singapore Flyer all the way to The Fullerton Hotel, while enjoying live acoustic and jazz performances by talented musicians every Friday and Saturday. Psst: Live music with cocktails and views of the sun setting over the CBD skyline? Sounds like a great idea for a date too! Find it at 3 Fullerton Rd, #03-01, The Waterboathouse, 049215. Click here for more information on The Rooftop. Are you feeling kinda listless? Maybe work was tough this week, and you just want to drown your sorrows in soulful songs and a pint. Head down to Crazy Elephant for a night of Rock ‘n’ Roll Blues, ice-cold beers, and the company of music lovers. Catch The Blues Machine, one of the best rock and roll bands in Singapore, on Tuesdays, Wednesdays, Fridays, and Saturdays. You can also steal the stage during the Crazy Elephant Jam Sessions that happen every Sunday. Unpretentious and no-frills, this bar forgoes fancy embellishments for quality tunes and a relaxed atmosphere, drawing crowds of revellers every night. Find it at 3E River Valley Rd, #01-03/04, Singapore 179024. Click here for more information on Crazy Elephant. 6. Blujaz Cafe: Party all night long! If you’ve been itching to dance the night away, head down to Blujaz Cafe and get your groove on! Everything you need for a fun night out can be found in this hipster restaurant and bar. Grab a hearty dinner at the Bohemian-inspired dining area, then head upstairs to enjoy some live music and groove to the beat on the dance floor, or soak in the chill vibes with a drink at the bar. Casual and lively, Blu Jaz cafe plays jazz, hip-hop, reggae, and every genre you can think of. It also hosts regular events ranging from open mics to rock nights, making Blujaz Cafe our go-to for a relaxed night partying and having fun. Find it at 11 Bali Ln, Historic Kampong Glam, Singapore 189848. Click here for more information on Blujaz Cafe. Those of us who frequent Haji Lane will probably have noticed this hipster bar spilling over into the streets. Funq is the ultimate crowd pleaser, featuring up-and-coming local musicians performing popular hits busker style. It doesn’t matter where you came from; whether you’re dressed to the nines or look like you’ve just rolled out of bed, everyone’s welcome to join in the fun! Just pull up a chair, grab a drink, and enjoy the show. A little rough around the edges but full of spontaneity, Funq is the place to be for some low-cost, post-dinner entertainment. Find it at 20 Haji Lane, Singapore 189213. No list of live music venues would be complete without the classic Wala Wala. Even our parents would probably have some fond memories of this familiar Holland Village haunt which has withstood the test of time, hosting the best live music acts in Singapore for twenty years. With local superstars like Shirlyn & The UnXpected, Jack and Rai, and EIC, you’re guaranteed great music all night long. If the music isn’t enough, maybe the cheerful and laid back atmosphere and comforting finger food will convince you to head down for a nostalgic evening of walking (or dancing) down memory lane. Find it at Holland Village, 31 Lor Mambong, Singapore 277689. Click here for more information on Wala Wala. It’s Egg Hunt time: this week, find your hidden eggs in 10 of the restaurants listed on our new Live Music Guide. Good luck!